This NASA chart depicts the number alien planet candidates identified by NASA's Kepler spacecraft as of January 2014. Image released Jan. 6, 2014. Five rocky planets are among a slew of newly discovered alien worlds found by NASA's prolific Kepler spacecraft. The planets, which range in size from ten to eighty percent larger than Earth, were announced Monday (Jan. 6) at the 223rd meeting of the American Astronomical Society in Washington, D.C.
Two of the newfound rocky planets, named Kepler-99b and Kepler-406b, are both 40 percent larger than Earth and have densities similar to lead, the researchers said. But, the chances of finding life on these exoplanets are slim, they added, since the two planets orbit their respective stars in less than five days, making these worlds sweltering and unable to support life as we know it. Geoff Marcy, a professor of astronomy at the University of California, Berkeley, presented the findings, which included the masses and densities of 16 new planets — so-called mini-Neptunes — that are between one and four times the size of Earth. 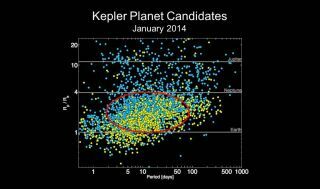 "Kepler's primary objective is to determine the prevalence of planets of varying sizes and orbits," Natalie Batalha, Kepler mission scientist at NASA's Ames Research Center in Moffett Field, Calif., said in a statement. "Of particular interest to the search for life is the prevalence of Earth-sized planets in the habitable zone. But the question in the back of our minds is: are all planets the size of Earth rocky? Might some be scaled-down versions of icy Neptunes or steamy water worlds? What fraction are recognizable as kin of our rocky, terrestrial globe?" Follow Denise Chow on Twitter @denisechow. Follow us @Spacedotcom, Facebook or Google+.